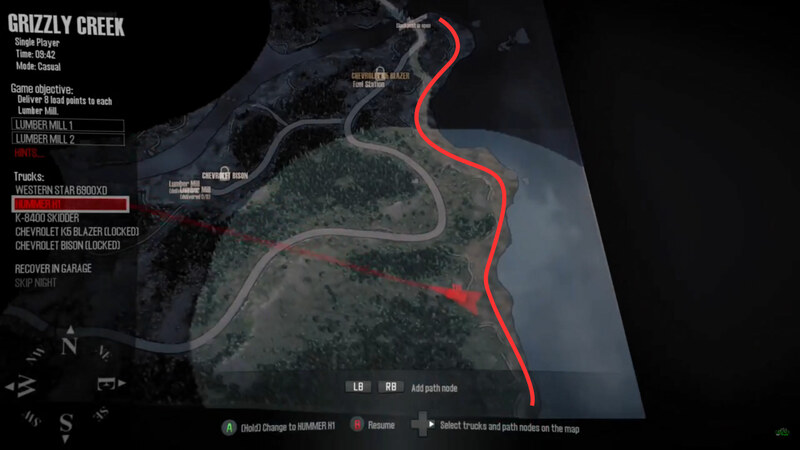 As far as I know, this can only be obtained on the map Grizzly Creek, as it is the only one of the two DLC maps with a shoreline. The best vehicle to do this with is the Hummer, as a lot of the other scout vehicles will have difficulty getting traction in the sand. There are two sections that count: either the shoreline east of the starting garage, or the longer (and preferred) shoreline to the southeast (pictured). Start a new casual game with a couple of Hummers (and repair points are probably a good idea too). Drive up and down the shoreline (red path). Only the sand counts. There is a fuel station on the road nearby if you get low on fuel. If you tear up both Hummers on the rocks that the developers have lovingly put there for you, or tear up the beach too much that it becomes impassable, just start a new game. The red path is about 0.6 km long, so it will take several trips back and forth to accumulate 10 km. There are currently no gaming sessions for the Beautiful Tan achievements that you can join - why not register and make a new session?